Two cheeses sat on the table at Vermont Creamery in Websterville last week, warming to room temperature. To a casual observer, they appeared mostly identical. Both were packaged in shallow terra-cotta crocks, the curds encased in wrinkly skin, matte with powdery fuzz. Both were samples of the creamery's brand-new St. Albans cheese. The company's first certified non-GMO (genetically modified organism) offering is named for the St. Albans Cooperative Creamery, which supplies the milk for Vermont Creamery's cow's milk cheeses. It's styled after a traditional, smooth and rich triple-cream French fromage called Saint-Marcellin. The cheese is made entirely with milk from Paul-Lin Dairy in Bakersfield, which was certified as a non-GMO dairy at the creamery's behest. Vermont Creamery cofounder Allison Hooper cut into one of the cheeses on the table. Made earlier this month, it had a rind that gave way to a melty layer, which smelled of earthy funk and tasted of bloomy, ripened cream. Toward the center of the round, the curd was firmer — pasty, milky and fresh, sharper than the soft bit and slightly tart. By contrast, the older cheese, made in August, was smooth and creamy all the way through. Its scent was of mushroom and dairy barn; on the tongue, it swirled with flavors of salted butter, wood and nuts. As the cheese ages, Hooper explained, enzymes metabolize its proteins. This transforms solids (found in the younger cheese's pasty center) into liquids and creates the complex flavors that characterize any fine soft-ripened cheese. Hooper began exploring these styles while working at a 40-goat farmstead in Brittany, France, during a college semester abroad in 1980. "I ate all this awesome cheese every day," she recalled. "I thought to myself, Why don't we have this in America?" Four years later, she partnered with Bob Reese to found Vermont Butter & Cheese Company. From her husband's milk room in Brookfield, Hooper made chèvre, fromage blanc and other simple goat cheeses — exotic stuff for 1984. In 1988, the creamery moved into a warehouse near the Websterville quarries, where its home base remains today, though the company swapped its original name for its current one in 2013. 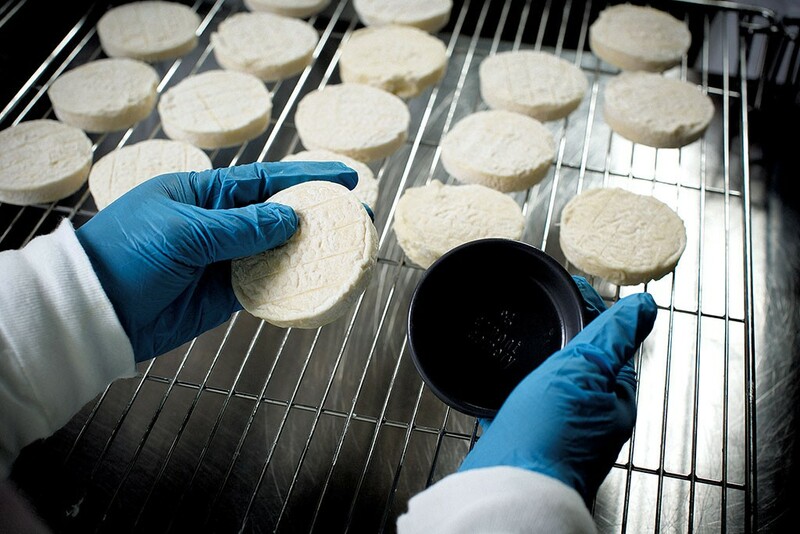 In 2001, the company introduced its first aged, wrinkly-rind goat cheese, Bonne Bouche. But Hooper struggled to produce the delicate soft-ripened cheese, with its finicky geotrichum rind, in a space designed for chèvre. Adeline Druart — then an intern, now the company's president — told Hooper to separate the operations if she was serious about making aged cheeses. Hooper conceded. "I just knew that if we could nail it, Americans would really love these cheeses," she said. Druart designed a second cheesemaking facility for the other side of the building. The creamery relaunched Bonne Bouche in 2006, and its aged-cheese operation has grown to include five cheeses. Their production has swelled by about 25 percent each year. "This is what we're building our future on," Hooper said. "If you want to work in this marketplace, you need to come with something unique. We're really the only [American] company that's making these styles." Early last year, Hooper and her team worked with Murray's Cheese in New York City to develop St. Mark's — a Saint-Marcellin-style cheese named for the East Village street — following a federal import ban on the French original. After making this exclusively for the Manhattan cheesemonger for some months, the creamery was free to release a facsimile under its own brand this fall. To Hooper, the timing seemed right to pilot a non-GMO product. In 2013, Whole Foods Market — a major Vermont Creamery retailer — pledged to require its suppliers to label GMO products by 2018. A year later, Gov. Peter Shumlin ratified Vermont's labeling law, which required GMOs sold in the state to be labeled by summer 2016. Though a congressional bill nullified Vermont's law, the ongoing debate indicates growing consumer interest in GMO transparency. It's worth noting that all certified organic foods are also GMO-free — organic certification precludes the use of GMOs, and there are many organic cheeses on the market already. But non-GMO certification recognizes that organic practice doesn't work for every farm. At livestock operations, for example, a farmer may wish to treat a sick animal with antibiotics, which is prohibited under organic rules. For others, certification is too costly or time-consuming. Non-GMO certification offers a chance for nonorganic farms and food businesses that eschew GMO crops — and often chemical fertilizers, pesticides, animal hormones, drugs and other biotechnologies — to differentiate themselves from conventional practices. In Washington State, the Non-GMO Project provides certification, labeling and promotion to producers of non-genetically modified foods. The nonprofit also tracks market data. Since 2010, annual sales of verified non-GMO foods have ballooned from $350 million to $19.2 billion, according to Non-GMO Project communications manager Laura Ridenour. Project analysts predict that global sales will nearly double by 2019. At Vermont Creamery, Hooper was keenly aware of these trends. "Consumers in larger numbers each year would prefer not to buy GMOs," she said. "They don't really know why," she allowed, "but that's the way they feel about it." So, from a marketing standpoint, Hooper added, there's reason to go non-GMO. To do so, the creamery needed a steady stream of certified milk. And none of St. Albans Cooperative Creamery's farm members was certified. What if we transitioned just one farm [to non-GMO]? Hooper recalled wondering. She posed the question to co-op general manager Leon Berthiaume. He scrolled through his list looking for a farm that could pull it off. In the gentle hills of Bakersfield, the Stanley family has raised Jerseys at Paul-Lin Dairy for 30 years. Several times a week, a co-op tanker ascends the drive, taps into the bulk tank and takes the milk back to St. Albans. The farm's 30-odd milkers and young stock graze pasture spring through fall and eat hay in the winter months. The farmers supplement the grassy roughage with a little grain. Berthiaume surmised that, by switching to non-GMO grain, Paul-Lin could easily get certified, if all went smoothly. Then the farm could supply enough milk for Vermont Creamery to bring its new cheese to market. Sensing a match, the co-op manager connected the businesses. The creamery offered to facilitate certification and pay the associated fees. And — assuming robust demand for the product — the cheesemaker would buy Paul-Lin's milk at a premium that would more than offset the cost bump of switching to non-GMO grain. "We'd heard of non-GMO [certification], but [doing] it had never crossed our mind," said 27-year-old Claire Stanley via phone last week. But she and her parents, Paul and Linda, said the process was relatively easy. The new grain costs about $100 more per ton than conventional grain, though it's still substantially cheaper than organic. The Stanleys would be able to continue using their usual supplier, Morrison's Custom Feeds in Barnet, because the granary recently certified a non-GMO feed to service Shelburne Farms, Jasper Hill Farm and other local dairies. After 30 days on the new feed, Paul-Lin's cows could pass the certification audit. Diverting milk from the commodity dairy pipeline represented progress and stability for Paul-Lin. "Farmers in general are looking for new ways to market their milk," Stanley said. She didn't mince words about the certification's impact on her farm: "It changes the future of this dairy." Stanley recognized that her few dozen pastured cows represented a unique situation. "All of our fellow farmers kind of know that we do things differently," she said. Going non-GMO may not be practical for many Paul-Lin neighbors, who feed larger herds on corn silage sprouted from GMO seed. Back in the "cranking" room at Vermont Creamery, a wiry, hair-netted man named Jeff Craig worked to form cultured Paul-Lin milk into neat discs. "Smell that?" he exclaimed, addressing Hooper as she walked in. "Smell that?" "It smells so buttery!" Craig said. 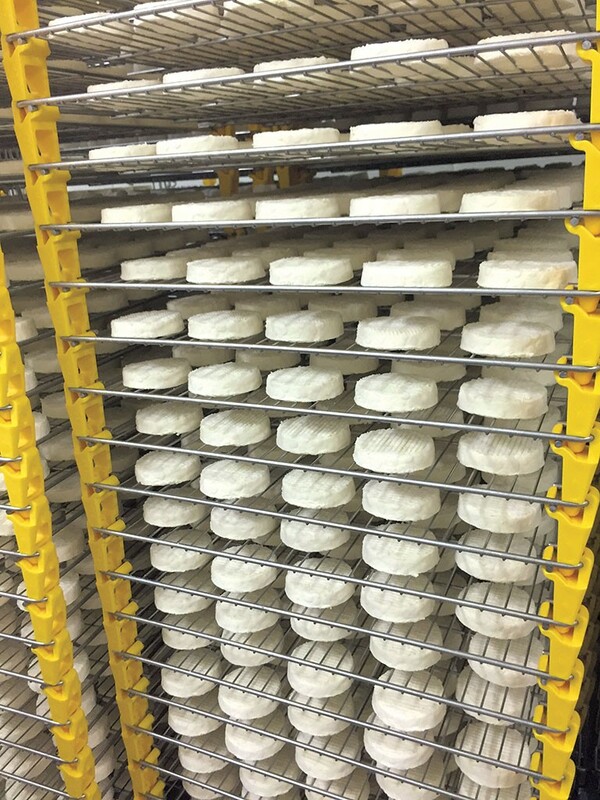 As pressed curd emerged from a machine, Craig cut it into discs one inch high, then gingerly placed them on racks to dry. He stacked the loaded racks, one over another, onto rolling frames, building a growing rack-tower city. "These will stay in this room for the night to dry," Hooper said. "We're running out of drying space — there's such demand for this cheese right now." Less than one month after its debut, St. Albans was looking like a runaway hit. At Paul-Lin, Stanley reported that the creamery had upped its orders from half to almost all of the farm's output. Hooper said the co-op is working to certify additional farms to meet demand for the non-GMO milk. Even if demand for the St. Albans cheese wanes, Hooper said, she plans to go completely non-GMO eventually. This summer, after the creamery's Ayers Brook Goat Dairy in Randolph switched its milking herd to non-GMO feed, it saw a net gain in the income-over-feed-costs equation. Though Hooper cited private concerns that GMOs require repeated applications of pesticides and herbicides to thrive, she doesn't judge farmers who can't or don't want to make the switch. Farming, she said, is hard and turbulent enough. "We're not asking dairy farmers to change what they do," Hooper said. But for those who are willing and able, she added, "Wouldn't it be nice if there was another option?" The original print version of this article was headlined "Got (Non-GMO) Milk?"